3d Man Thumbs Up With Strong Link Chains PowerPoint Templates PowerPoint Themes 1012 Emphatically define your message with our above Template which contains a graphic of Business Man having a chain in his hand expressing his Victory showing thumbs up. This image signifies the concept of conquest security triumph win and success. Deliver amazing presentations to mesmerize your audience with our template.-3d Man Thumbs Up With Strong Link Chains PowerPoint Templates PowerPoint Themes 1012-This PowerPoint template can be used for presentations relating to-"3d business man thumbs up with strong chain, success, business, signs, finance, people" Design goals with our 3d Man Thumbs Up With Strong Link Chains PowerPoint Templates PowerPoint Themes 1012. Download without worries with our money back guaranteee. 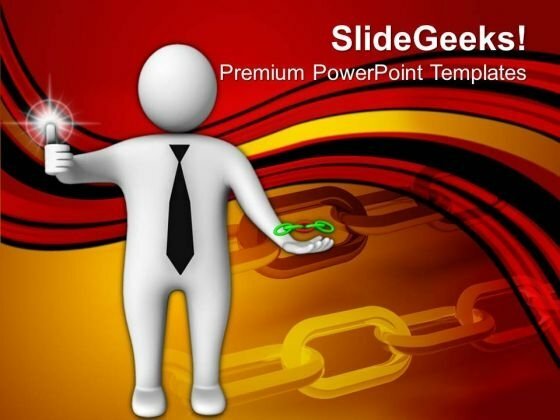 Our 3d Man Thumbs Up With Strong Link Chains PowerPoint Templates PowerPoint Themes 1012 are maintenance free. All they require is a dash of your thoughts.